Just in case you haven't already seen it, there will be twelve days worth of fabulous prizes given away randomly on Ellen Hutson's CLASSroom blog. I have posted directions for this little 1-1/2" square charm on the CLASSroom blog today, made with the Cornish Heritage Farms Shoe Boutique stamp set and soldering tools and accessories. Have you ever wanted to try your hand at soldering? Today's giveaway could enable you to do so. . . Be sure to scroll down past my post there to sign up for both today's and yesterday's prizes. What are you waiting for? Go sign up! 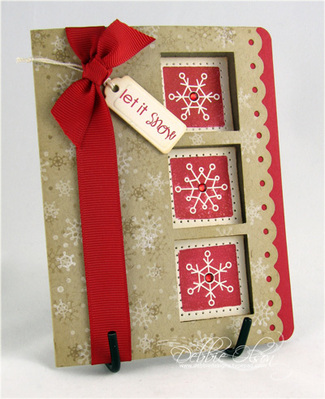 Next I have a Rustic Snowflakes card to share. Heather's sets just seem to want to be used with kraft cardstock, right? I added some Pure Poppy accents to this one, as well as some red Swarovski crystals to the centers of the snowflakes. I know that red isn't a typical snowflake color, but it seemed to fit the personality of this set--a warm, "homey" personality! 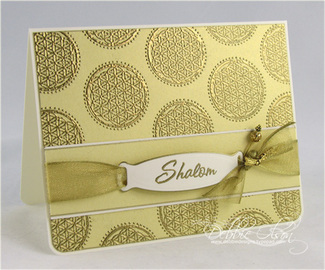 Finally, I have one Mazel Tov card to share--gold embossing powder, Shimmery Gold cardstock, gold ribbon, and even a gold head pin and bead. 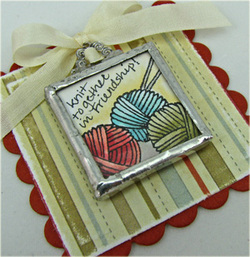 I used a Spellbinders ribbon tag die for the Shalom sentiment. 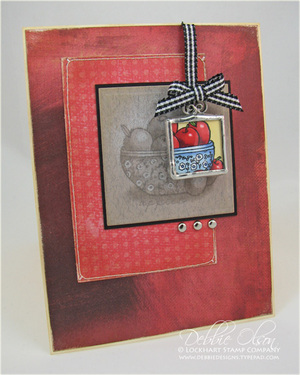 The new Mazel Tov stamp set fills a stamping niche in such an elegant way! Tomorrow night I'll share a very simple, fun ornament made with Merry and Bright--no soldering, I promise! Have a lovely day! This week's CPS challenge was a new twist: we picked any one of the past 79 sketches and made a card and something other than a card. The card part was simple enough; I had some new sentiments that I wanted to work around from Verve Visual's new Notes of Prayer. Sketch 41 seemed to fill the bill nicely for the shape of my sentiment. I used Anna, Audrey, and Klara from Cosmo Cricket's Dutch Girl Collection as background papers because of their soothing colors and warm feel. 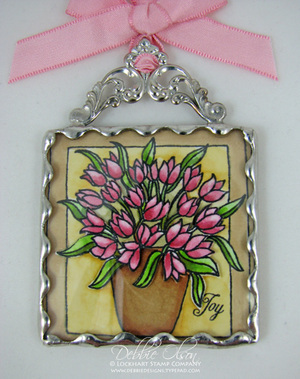 For the flower centers on the Anna paper, I used White Opal Liquid Pearls. (To get rid of the little point on top, give the underneath side of the paper a little thump.) I sewed the strips of Audrey and Klara onto a Spellbinders Scalloped Long Rectangle die cut and used a Ribbon Tags Trio die for the sentiment, stamped in PaperTrey's Pure Poppy ink--my new favorite red ink because it is so rich and deep! Self-adhesive pearls are the ivory ones, and twill is PaperTrey's Pure Poppy. It was fun to go back through all of the old CPS sketches and just find one to work with; I really should do so more often to get out of my layout ruts. Have a lovely day! Are you thinking ahead toward Christmas yet? 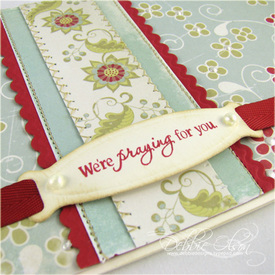 For the PaperTrey Ink Senior Team challenge this month, Nichole asked for Christmas ornaments. Once I started, the ornaments kept coming. . . I think I made six in all, and I still wasn't sure which one I wanted to post! You'll probably see a couple of the others later, but for tonight I think I'll share my Snowflake Serenade glass ornaments and gift tin. Two of the ornaments are soldered, but the third is very simple--and I think I might just like it best for the difference in time that it took! 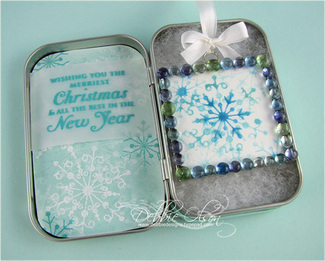 The gift box is a PaperTrey Ink large hinged tin, and any of the glass ornaments will fit into the tin.The verse inside the tin is from PaperTrey Ink's Holiday Wishes set. You really can't see the shimmer on the snowflakes that well, but I stamped them in Luminarte Twinkling H2O's in Sky Blue and Summer Breeze. I softened up the twinks by adding a bit of water, then used a waterbrush to coat the stamp well before stamping the white cardstock. The two pieces on the right are framed with 2" square Ranger Memory Glass, and the one on the lower left is framed in 1-1/2" square Memory Glass. 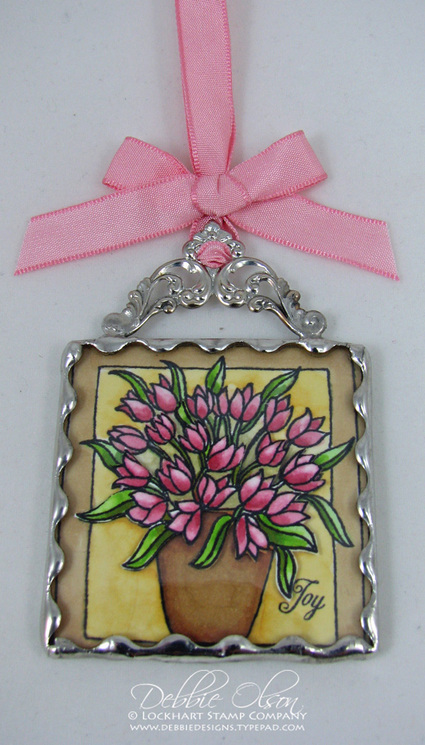 As I mentioned, two of the pieces are soldered, but the one with the little glass Dew Drops is simply framed with a Memory Glass frame (2" x 2", polished chrome)--it takes about 15 seconds to snap it together after you sandwich the stamped cardstock between glass layers--and that's if you go slowly! Of course I couldn't leave well enough alone and just let that shiny silver frame show. . . I glued on Water Dew Drops, which took perhaps ten extra minutes. This was a seriously simple ornament, but I'd still be pleased to give it to someone. Be sure to see these blogs for other Christmas ornament ideas: Lisa Johnson, Lauren Meader, Heather Nichols, and Amy Rysavy. Nichole might even play too! Have a wonderful Labor Day. The top piece is actually half of a piece; I was having a hard time getting my scrolls on tonight, so I gave up on them and bent a long piece in two until it broke, then used half of it to solder to the top edge. Next I ran a jump ring through the little scroll at the top--it worked better than the scroll pieces for me! If you are in need of more pictures to explain the steps, this charm involved the same steps as the one that I wrote a tutorial for here; I hope that it's helpful. I hope you have a delightful weekend! This is just a quick post to let you know that I wrote a soldering tutorial on this piece for Ellen Hutson's In Touch blog, and you can find it here. 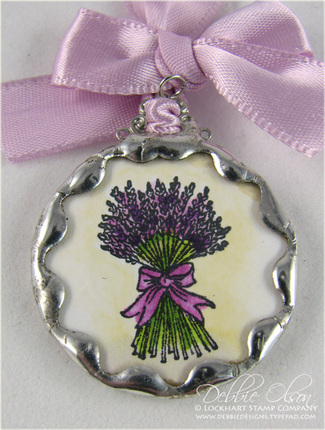 Actual size of the piece is about 1-1/4", and the focal image is the Lockhart Itty Bitty Lavender stamp. If you receive Ellen's newsletter, you will find at the bottom a coupon for 10% off of all of the Simply Swank soldering supplies that she carries. If you don't receive the newsletter and would like to, go to her home page here, scroll to the bottom, and sign up. 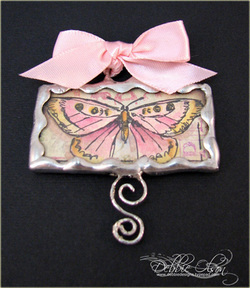 Just as "green stamps," here is an inchie notecard that I made the other day when I was trying out one of Ellen's new Spellbinders dies, the S4 165 Pinking Pierceability. This was a fun die! I decided that I needed to order a smaller piercing tool than I usually use. When I get back from CHA, I should have that smaller tool and can play with these edge dies a bit more. This inchie image is from the Lockhart Roses and Daisies Floral Couture line, and the gem is a Light Sapphire Swarovski Crystal. 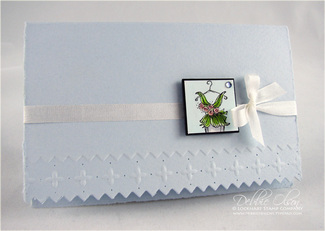 Card base is a pale blue Arturo notecard--similar to a Fabriano, if you've used that, but these come in colors too. The ribbon is a May Arts white silk ribbon. Well, I'm still working on samples to take with me, and I haven't packed yet. . . Wish me luck, and I'll try to share some CHA glimpses with you over the next few days! 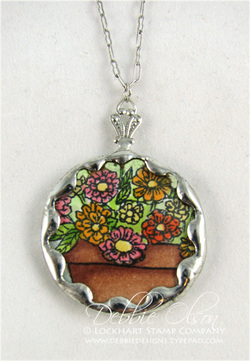 Here's the charm that accompanies the little gift card posted below. Actual size of the glass is 1-1/2" square, so it's smaller than shown here. I used the same Copic markers that are pictured in the post directly beneath this one. To get the scalloped edge on the solder, I used a scalloped-edge copper tape--a simple way to add a decorative touch. I used just a tiny dab of adhesive to make sure the added blooms stayed lined up on top of their counterparts underneath, then I taped, fluxed, and soldered as usual. Using that extra layer of glass is a simple twist that makes a really neat look! If you are looking for soldering supplies, you'll find pretty much anything you can think of here. Thanks for visiting! Enough babbling--it's late. 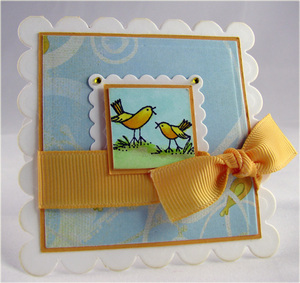 This little piece (1" x 2") is from a retired Stampin' Up set, Natural Beauty. 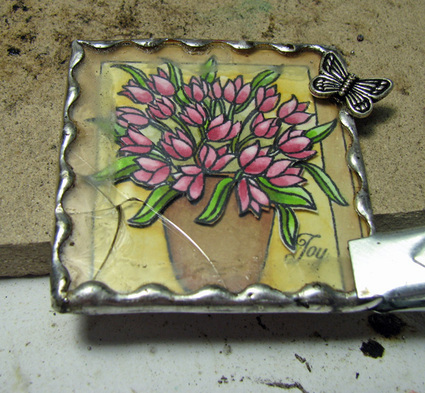 I watercolored the butterfly image and sandwiched and soldered it between two layers of glass. I twisted the little "s" piece from wire and used a jump ring at the top. The wavy soldering lines come from wavy copper tape--pretty cool stuff! If you'd like to explore soldering more, there's a detailed tutorial here for a simple piece. Soldering items (like the wavy tape in a variety pack) can be found here. I'll try to get a card made for tomorrow night! Have a wonderful day, and thanks for visiting. Today I had planned to get a lot of work done. We all know what comes of "the best laid plans of mice and men," don't we? 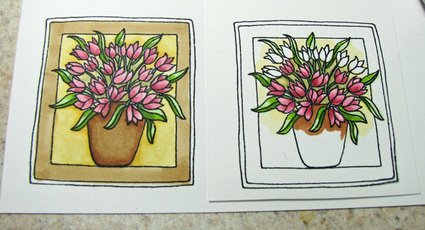 I still have a couple of 3" x 3" cards to share with you tonight, both with "inchie" focal points. My second inchie card has a soldered centerpiece that is attached by a glue dot; it could be removed to be used as a magnet. 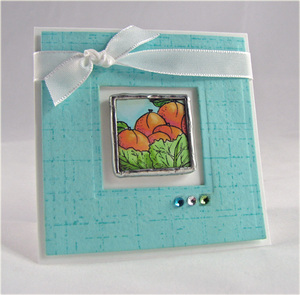 I chose a larger image, basket of peaches, and selected my favorite square inch of it to color and frame. Most of the markers were the same as the ones above, with the addition of a deeper green (G99) and some peach/pink tones (YR21, R02, R83). The rhinestones are teal, citron, and clear. I used a stamped background on this one, CHF's Scratched Grid backgrounder. The ribbon is some SU white taffeta. 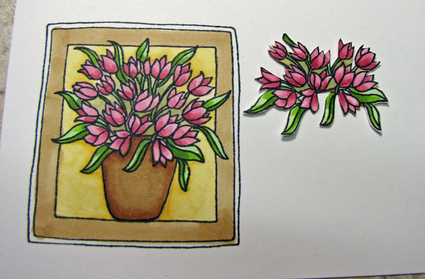 If you have been playing with inchies, don't forget to check out the Inchie Inklings blog for challenges and tips. I hope you have a wonderful weekend! I love tulips! 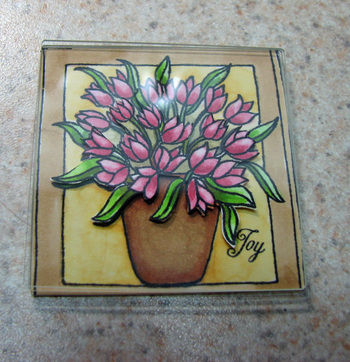 Some of my favorite stamps or stamp sets through the years have been tulip sets. I wish that you could see this little 2" x 2" charm in real life; it has a three-dimensional look to it because I tried a layering technique that I saw in a book by Lisa Bluhm of Simply Swank. She has used little vintage photographs, layered to form a tiny shadowbox effect. I thought that I could try a simple version with layering a stamped image. Next I carefully cut out around the parts of the second piece that I wanted to place on my top layer. Here you see both layers laid out on the 2" x 2" pieces of memory glass that I was sandwiching together to form the charm. I have in order: glass, upside down piece of background paper that will show on the back, colored full image, glass, colored partial image, and glass. 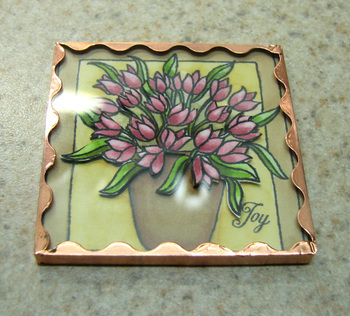 I used a tiny bit of adhesive to attach the top tulips to the glass to make sure that they would stay in registry when I picked up the piece to wrap it in copper foil tape. If you look carefully, you can see a bit of the dimension here. On the second try, I left the butterfly off; I wasn't sure if he added, or if he didn't look quite right. So I opted for a larger corner piece as a top and left the butterfly off. If you would like to know more about the mechanics of soldering in a good step-by-step tutorial, check out Ellen's post here. I won't be around a computer for a couple of days; but if you leave questions in the comments section, I'll try to address them when I have computer access again. Thanks for visiting! 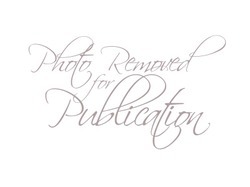 Soldering iron, equipment, and accessories from Ellen Hutson, LLC. It's been a busy weekend! I've gotten a lot done, though I can't share all of it quite yet. How about some bits and pieces? I finished up this card and inchie charm set just yesterday. Color inspiration and patterned paper came from Cosmo Cricket's Little Boys Biography Collection. I've always loved this paper, and the colors just seemed to be perfect for balls of yarn. 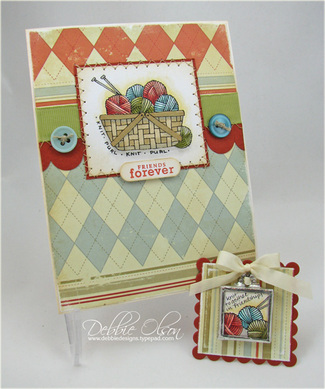 Stamps are Basket of Yarn for the card and Knit One, Purl Two for the inchie charm as the focal images, and Faux Ribbon for the card front sentiment. I used my Stampin' Up word window punch to punch the sentiment, and my plain and scalloped square dies to mat the inchie charm. 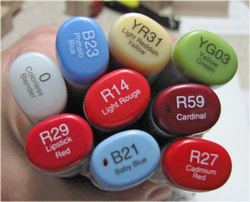 To color the images, I used the Copic Sketch markers pictured here. The marker end with no number on the end was an empty Copic marker that I filled with a mixture of clear blender fluid and YR31 to get a muted yellow glow. I'll be posting a PaperTrey Sneak Peek in a few hours. 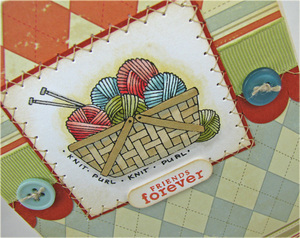 Don't forget to check Nichole's and Amy Rysavie's blogs for today's sneak peeks! Thanks for visiting. 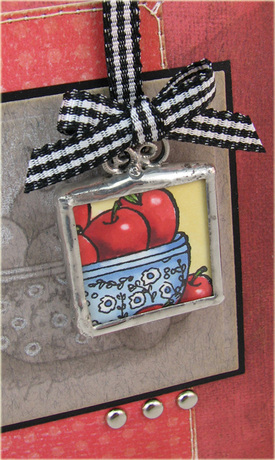 Here's a new twist on "apples for the teacher," an apple inchie charm! I had colored a few fruit-inchies last week and wasn't quite sure what I wanted to do with them. Tonight I started playing with this Apples in Chintz image and trying to think of how to present it as part of a whole. Spotlighting came to mind; remember when we stamped a simple line image, re-stamped it, colored the second image, then used a circle punch to punch out the colored image and layer it on top of the original line image? That's the concept that I used here. I stamped the monochromatic base layer of the main image (Lockhart) on Prism China cardstock, then colored it with a Copic W-1 marker and a white Prismacolor pencil. Next I die-cut and embossed it with my Spellbinders Nestability Plain Square dies. The background papers are Flirt by Memory Box. I picked them because of their painterly look, trying to play up my framed artwork theme. The inchie apples were stamped in Black Brilliance ink and heat-set, then colored using the Copic markers shown on the left. I used three silver mini brads to tie in the color of the soldered frame and help balance out the visual heaviness of the top of the card. If you are interested in playing with inchies, you may want to visit the new Inchie INKlings blog; there's a monthly challenge posted and a prize attached to it. Thanks for visiting! If you've e-mailed me in the past few days, I'm slowly working through the e-mails. I've had some satellite internet outages this weekend, as well as some other challenges. Thanks for your patience.